Winner in the anime division of the 2016 Sugoi Japan® Awards. Hers was a white lie built on a grain of truth that snowballed as one lie after the other piled up. At first it was only hers, but then it became something that the two of them shared together – like a secret, a world upon which no other could encroach. He may have been “Friend A,” and she “the girl that loves my best friend,” but they were masquerading around a truth that neither one could openly admit because ultimately, the truth was much more painful. Your Lie in April is a deceitfully masterful series that initially appears light-hearted and colorful, its palette boasting pastels that lend to the idea of it being another romantic comedy. Yet the moment we step past the disillusionment that it casts upon us by its false prefaces, we quickly realize that what we have immersed ourselves in is actually a tragedy in the making. Tragic not because of a single element but because of all of its parts, and yet at the end of everything, this isn’t a series about tragedy. It is a series about learning to heal, learning to move on, and learning to accept the parts of ourselves that we’d rather pretend aren’t there. Part of that is accepting that sometimes we need a helping hand to take that first step. Part of it is learning to say goodbye when the time comes. What is so compelling about the storyline is that it’s not merely an adventure into first love, it delves into the reality of post-traumatic stress disorder, childhood abuse, and chronic illness. It doesn’t paint any of these as artistic or tragically beautiful—they are horrible, they twist people, they ruin the best moments, and they have a long-lasting impact. No one is completely black-and-white; everyone has their short-comings, fleshed out in full before our eyes. They have their hang-ups, their strengths, their struggles—and it’s in these characters that this series really takes off in full stride. It would be enough for them to be multifaceted with equal amounts of depth, but they take it a step further in painting the reality of youth. Older anime fans may critically analyze the series as an unrealistic approach to young teenagers, but that pessimism overlooks the reality of what it was like for us to be that age. We were all that point when we found our first love, when we thought it was forever, when we poured our passion into something that ultimately would not come to fruition or last. That’s what being young is about—and that’s what Your Lie in April gives us. Granted that it may veer a bit over-dramatic at times in its representation of youth; there are moments of symbolism or hyperbole so overt that the cheesiness makes you shift a little uncomfortably in your seat (but I promise it’s not enough to gag you). Given that this is, however, a rather common trope that runs in series with heavier themes, it’s not necessarily a huge setback for an otherwise solid series. In the end, it is intended to be a fictional representation that conveys more than just what can be summarized in a few sentences or less. The sound is completely on point, and the soundtrack artfully matches the emotions intended to be represented in each scene. From the actual classical music to the opening and ending, everything fits in like a jigsaw puzzle to give a full, satisfying final piece. When the characters analyze someone’s playing as harsh, rigid, and stilted, we can hear this—whether we are knowledgeable about music or not. Your Lie in April conveys emotion to us not just visually but aurally as well. The animation is wonderful with bright, vibrant colors that bring the characters fully to life. There is an amazing, visually perceivable transition for the characters as time passes, particularly in regards to Kaori as the series moves on. It occasionally has some stilted moments but nothing outrageously noticeable to detract from the overall quality. Ultimately, Your Lie in April is a story that starts out of the gates moving a bit slowly, but the pace matches the tone of the series. Structurally, it is a solid story of youth that dramatizes some aspects but never distracts from the intended message. On top of its other strong points, it’s aurally and visually a joy to the senses – and to anyone appreciative of a series willing to realistically approach the conflict of childhood abuse and the resulting trauma in a positive way. It’s not without a few setbacks, but in the end, Your Lie in April fashions itself to be a stand-out romance series that reminds us that while some relationships may be transient and brief, some people will come into our lives at just the right time for just long enough to touch us in a way we never thought possible. From a quick glance at all the other top reviews, this series seems to be one that many people rave about. While there's certainly qualities in this show that are really good, I found myself rather unimpressed to be brutally honest. Kousei Arima was a prodigy at playing the piano. He dominated every competition on a regular basis by playing the music perfectly as it was intended by the composer. He was so dominant to the point where he became famous among child and adult musicians alike. However, after the death of his mother (who was also his instructor), he was unable to cope with it and eventually lost the ability to hear the piano. He then quit shortly after. 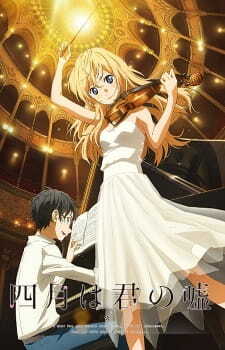 For the next couple of years, the world around him became dull and lifeless aside from a couple of his friends, until he met this extremely cheerful violinist, Kaori Miyazono. She revealed to him a side and style of music he never knew existed, and eventually convinced him to give the piano another shot. The premise doesn't sound too bad. In fact, the way it handles the romance plot is pretty unique. It isn't just simply your typical boy meets girl and then they eventually confess, blah blah; there's a lot more to it than that. It focuses more on Kousei's development as a result of Kaori's carefree happy-go-lucky personality. The story is told primarily in Kousei's point of view, and likewise the plot revolves somewhat around him. Other characters do get screen time as well, though, and occasionally we do hear their take on things too. A big thing that really makes the story stand out (in the first half, particularly) is how it portrays the music. Why do we play music? Who are you playing for? What message are you trying to convey? Music isn't just there to pleasure your ears, it's used as a tool to speak from the heart. Who you are as a person, what you've gone through, and what you strive for are all expressed in how you play music. The notes may be the same, but the feel of the song can vastly vary with the way people play it. In other words, you take the music and make it your own. The way this narrative and message are pushed is rather distinct and effective in my eyes, and it was one of the few things that kept me captivated throughout the series. Despite how well this all is presented, there were still quite a lot of flaws, particularly in its execution of several storyline elements. Melodrama. It's alright to have it in moderation (it’s a show about teenagers after all- there’s bound to be at least some), but it was taken to a whole other level in this show. Almost every episode contains at least one overreaction to an event, almost to the point where it became hard to really feel the proper emotion you were supposed to in the particular scene. There were some instances where this was properly used and was actually beneficial to what was going on, but more often than not, I found myself cringing and unable to relate to the character(s) at all. Pacing. The pacing of this show was all over the place, but generally speaking, it was so slow to the point where it felt like it was beating a dead horse. Literally, I could look up the word "monologuing" in the dictionary and find the cover art of YLIA. Episode after episode, there was an absurd amount of redundant soliloquy to the point where it became hard to watch. Again, as the saying goes: "everything in moderation". Internal monologue isn't inherently a bad thing, but it starts to parody itself when it gets overused. Thanks to stuff like this, it takes longer than it needs to for things to get going and actually progress. Lastly, there's the comedy. Quality of comedy in general is unquestionably subjective (personally I didn't find a whole lot of it funny, but that's just me), but that's not where the issue lies. My gripe with it is that it was terribly misplaced. You're in the middle of this deep, sad scene, and then all of a sudden you're slapped in the face with comedic relief that doesn't fit the scene at all. To put it bluntly, it kills the mood. The story had a LOT of potential. I, like many others, was hooked at the beginning, but found it harder to watch as the show goes on. It really makes me wish that this was a 12 episode anime instead so that things didn't overstay their welcome. The art in this show fits the feel of it really well. The characters designs are rather unique; they each all have full lips rather than a simple line like you see in almost every anime nowadays, and it's little subtleties like this that adds a sense of realism to the show. The brightness of the setting also appropriately fits each situation. The color palette often fits the mood of the scene very well; it's colorful and bright when things are more lively, dark and dull when things are more depressing, so on and so forth. The actual art itself isn't bad either. Animation was pretty solid and up to par with today's standards, but occasionally it was less than stellar. Now, I'm not a fan of classical music at all. I don't necessarily hate it, it's just not my bread and butter, but I've started to open up to it a lot more than I originally was. The OST is nice and really adds to the emotions that the specific scene is trying to convey. The solo performances are especially good for reasons I've already touched upon. I'm also a personal fan of the OPs and EDs, both of which suit the show well. Not much else to say here, really. It's just solid all around, which is important for a show like this. As a romance and drama, the characters really are the backbone of the entire show. With the slower pacing, the characters get added depth, which is critical for a show like this to do. I must say, it did a fine job in that aspect. Many characters had their own backstory (although there are a few issues with this that I’ll get to), and there aren't many one-dimensional characters that get major screen time. Most importantly, they all have likable qualities about them that make them endearing to the audience, creating an emotional bond between us and them. Something that I felt was handled rather well was the development of Kousei. Being the main character, it's pretty important for him to be fully fleshed out, and thankfully he is. He starts out as a mopey, depressing, and generally dull kid, but gradually develops into something much more. After losing his mother, he really had no reason to play music. All he ever knew was to play it perfectly as the composer intended, and for the purpose of pleasing his mom. Enter Kaori. Her unique style of playing opened up Kousei's eyes in a big way, and inspired him to take up music again. His journey together with Kaori and friends has been helping him break out of his shell, and his progression bit by bit was superb. While I'm singing a lot of praise here, you'll notice the score I gave is again rather mediocre. Hear me out. Many of the side characters were pointless; their development overall pretty much either served no purpose and/or wasn't done well. Often times, instead of adding to the story, their screen time swayed away from the main plotline which is not how it's supposed to work. Yes, I understand that people might think it's nice and cute to see someone else's story every now and then, but again, the issues I have are 1) it sways the show away from the main narrative without connecting to it at all, and 2) the way these characters are handled just feels half-assed when compared to how well Kousei is developed. If this were a longer show where separate characters could have their own little mini-arcs, I feel like this would have been handled much better, but obviously that wouldn't be possible for a shorter seasonal anime. Another thing -- Kaori. This is kind of tied into the pacing, which I also touched upon earlier. She never really received significant development until the very end of the show. Up until that point, she's nothing but a mere plot device used to stir up drama. For the duration of 21 episodes, she was just a cute girl that's meant to be likable and appeal to the audience, but with no depth whatsoever. It would have helped substantially to show her insight on the status quo as the show went on. Needless to say, I didn't enjoy this anime a whole lot. There are redeeming qualities that I'm not going to overlook out of blind hate, but overall, this just wasn't for me. In my opinion, this anime doesn't deserve to be rated as high as it is. Again, it's not the worst thing I've ever seen; there's several redeeming qualities, and I can completely understand why someone else would enjoy it. However, to be honest, it seems pretty undeserving to be holding the #13 spot overall at the time this review was written. I'll try to sum it up as simply as I can: for more "intellectual" (for lack of a better word) viewers who care more about logic and technicalities, stay clear. As a show catered for a younger audience, it’s very clear more effort was put on style rather than substance, and that can make it frustrating to watch. For more casual viewers just looking to bathe in their feels, this is definitely worth a look. There are some quirky characters here that you might enjoy, and the relationship between Kousei and Kaori is definitely one that might leave a lasting impact on you. "Did I reach you? I hope I did." I nearly skipped this gem just because of the music tag. Not really big into music anime but somehow the art dragged me into watching the first few episodes. First episode was an average episode with few interesting plot lines. But the second episode was the hook. Irony. The tag that made me nearly skip this anime was the one that kept me in it. The music, the music... THE MUSIC.. what can I say? It was just right down my taste. Never in my life did I thought of "oh hey let's listen to some classical music" but this anime opened a new taste in music in me. And I'm grateful for that. The first half and second half have clear differences with a very smooth pacing and objectives in mind. Some may say the pacing was slow and sometimes it felt that a point is being dragged out for long. As much as I understand where they are coming from, I feel that this series took the right amount of time to build up for the many impact full moments that is present. The inner monologues that the series loves to do felt right to display the conflicts that our characters are fighting with. Also, the conflicts dealt with are very realistic and people can very much relate to them. I happen to be one of them being able to relate to our main male protagonist. The cast of characters in this show is pretty high. As a 22 episode anime, I think it did an excellent job portraying those characters. As most animes, not all the characters were fully fleshed out, and I didn't expect it to do so. The ones that mattered most were developed beautifully. Besides, nearly everyone's thought process were clear, motivations/purpose in tact and passion which shone through. Sound is something that I will not even talk about since it is subjective. The main reason, however, that I will not dive deeper is because for me, it was perfect. I couldn't have asked for anything more. Animation wise. Throughout the whole series, it was standard stuff from A-1 Pictures. It did have some drop from time to time, especially during the comedy segments, which I didn't find distracting but it wasn't great to say the least. Animation stood out where it counts. Those performances. I would have been really been disappointed if the animation was average in those moments, because of how beautiful the soundtracks are. But A-1 delivered, and they both complimented each other outstandingly. By the end of the series, I was just left in awe, and honestly a bit (extremely) emotional. To compare, the 'feels' in this series (my opinion) surpasses the highly praised Clannad: After Story for one simple reason. I was just slightly more attached to the relationship our main characters shared than I was with Clannad. But the story is not about tragedy. It's about inspiration, passion, moving forward, family, friendship, helping each other (many more). It is about life and how hard it can be to carry on, but you still gotta do it. You still gotta live your life to your fullest. "If you can't move with your hands then play with your feet! If you don't have enough fingers, then use your nose as well! Whether you're sad, you're a mess, or you've hit rock bottom, you still have to play! That's how people like us survive." - Kaori Miyazono. My Thursdays won't be the same after finishing this anime. Shigatsu has taken me to a world of music that I will never forget. Even though the story isn't anything new, the way it was written and directed make it feel like one. It is a story that revolves around music and how it connects people and how it affects them. It does not only affect them in a good way, but in a bad way too. And with that premise, a beautiful story about tennagers started. Although there were some characters that didn't get a proper development to know and understand their own problems, motivations, and dreams, they didn't feel empty and meaningless. They all had a purpose and most of them where helpful to our main characters. They didn't feel cliché neither, even when we got some of them like the childhood friend and the dandy best-friend. And the best part, at least to me, is that there was no fan-service. I didn't get to see a flaw in the animation in the 22 episodes aired. The palette of colours used, especially the blue ones, were gorgeous, while the performance moments were dynamic and realistic. Not to mention the opening and ending sequences, which are to date some of my favourites of all time. Add to this a beautiful ost and amazing songs for the openings and endings and you'll feel in heaven. The opening songs were upbeat and represented a good tonal contrast to the story, while the ending songs complemented it, especially the second one, which can make you cry (if you were not crying already) after the emotional final episodes. Overall, this anime has been one of the bests I've ever seen. It hooked me since the first teaser, and never let me go until the last episode. It is not a hard story, so everyone can enjoy it as much as I did. With loveable and relatable characters with deep stories, a gorgeous animation and an amazing score, I'm pretty sure that this is one of the best anime from the past few years, and the best (TO ME) of this season. I can recommend this show to anyone who want to watch and experience a good, heart-warming romance anime.